Don't confound this regional state of the Zhou period with the empire of Wu 吳 (222-280) of the Three Kingdoms period 三國 (220-280) or the Wu dynasty 吳 (902-937), one of the Ten States 十國 (902-979) of the Five Dynasties period 五代 (907-960). Wu 吳 was one of the larger regional states of the Zhou period 周 (11th. cent.-221 BC). It was not one of the Chinese states of the Yellow River plain but a native, semi-"barbarian" state on the southeast coast, in the southern parts of modern Jiangsu. 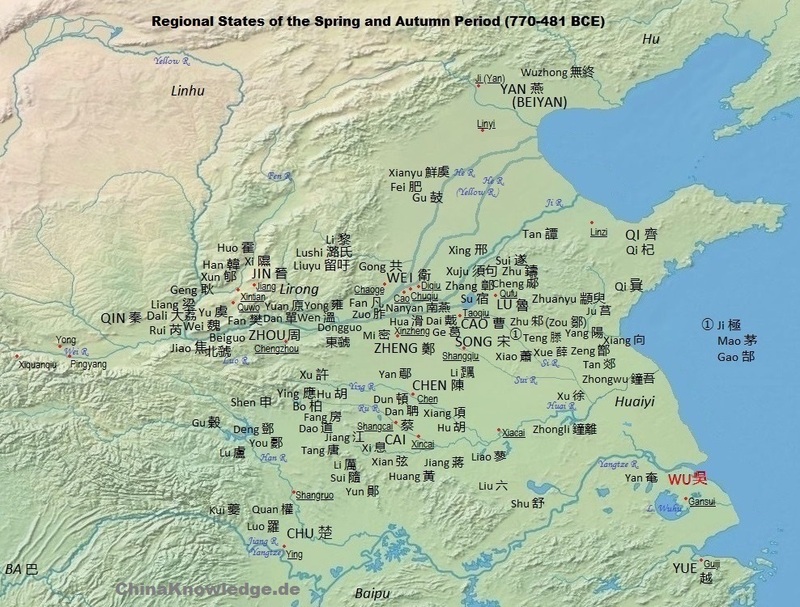 Wu dominated the southeastern part of the Zhou empire during the last decades of the Spring and Autumn period 春秋 (770-5th cent. BCE), before it was conquered by the state of Yue 越. The territory of Wu covered the southern part of the modern province of Jiangsu, around Lake Taihu 太湖. The land of Wu was rich of useable ores, which the craftsmen of Wu used to forge excellent swords. Map according to Tan Qixiang 谭其骧 (1987), Zhongguo lishi ditu ji 中国历史地图集. Wu was located around Lake Taiku in today's Jiangsu, its capital was what is nowadays Suzhou. The king of Wu competed with that of Yue and was counted among the five hegemonial lords. Yue in the end proved stronger and conquered Wu. Click to enlarge. The founders of the kingdom of Wu were Taibo 吳太伯, the "Great Earl", and his brother Zhong Yong 仲雍, who were, according to legend, older brothers of Ji Li 季歷, who was the father of Ji Chang 姬昌, better known as King Wen 周文王 and founder of the Zhou dynasty. Because Li Ji was more intelligent and righteous than his older brothers, and because of his virtous, "sacred" son, Ji Li was selected as the heir of the family. His brother thereupon left their homeland and migrated to the southeast, where they settled down among the native barbarians of the "thorny land" (Jing Man 荊蠻). It is said that their adopted the local customs and habits, tattooed their skins and cut short their hair. Taibo, whose personal name is not known, called himself Gou Wu 勾吳 (a term also interpreted as the name of the tribe or people), and was soon chosen as ruler of the people of Wu. Because he had no son, he was succeeded by his brother Zhong Yong. When King Wu 周武王, son of King Wen, conquered the kingdom of the Shang dynasty 商 (17th to 11th cent. BC), he sent an envoy to the country of Wu, where in the meantime Zhou Zhang 周章 was ruling, a great-grandson of Zhong Yong. He was confirmed by King Wu as ruler of Wu, and his younger brother Yu Zhong 虞仲 was made regional ruler of the small territory located near a former residence of the Shang. This small state called Yu 虞 was conquered many generations later by Duke Xian of the state of Jin 晉獻公 (r. 676-651 BCE). The country of Wu became stronger under the rule of King Shoumeng 壽夢 (r. 585-561). This political rise was supported by the development of an army that was created under the instruction of Wuchen, Duke of Shen 申公巫臣, a noble from the state of Chu 楚 in the west of Wu who had fled for political reasons. Although Shen's motive was actually to construct himself a weapon to take revenge in Chu, he so helped Wu to become the dominant power of the southeast. In 570, Chu attacked Wu, and its army was utterly defeated so that the king of Chu had to withdraw into the mountains. King Shoumeng had four sons, namely Zhufan 諸樊, Yuji 餘祭, Yumei 餘昧 (also written 餘眛) and Jizha 季札. The latter was the most competent of them and was planned to become the successor of their father, yet Jizha observed the appropriate piety towards his older brother, and so Zhufan (r. 560-548) became the next king. Jizha, in order to escape trouble and to fulfill his filial duty, gave up his status of nobility and became a farmer. King Zhufan elevated him to the status of lord over the territory of Yanling 延陵. Zhufan planned that the throne might be handed over in succession to each of the brothers, with the intention that in the end Jizha might become king. During King Zhufan's reign the army of Chu defeated that of Wu. His successor was, as promised, his younger brother Yuji (r. 547-531). King Yuji received at his court the former counsellor of the state of Qi 齊, Qing Feng 慶封, who had fled because of troubles with another noble family in Qi. King Yuji made Qing Feng governor of the town of Zhufang 朱方 and gave him his daughter to his wife. Qing Feng was later killed during a mission to the court of Chu. This murder caused a long-lasting period of war between Wu and Chu during which the two states mutually occupied towns in the border zone. Prince Jizha was sent out as a diplomat and undertook a long travel to all important states of the Zhou empire. In Lu 魯 he had the chance to enjoy and comment the ancient songs and dances. He also visited the court of Qi, where he urged Yan Pingzhong 晏平仲 to give up his official position and his territory in order to escape destruction by other noble families. In fact, quite a few worthy families like the Gao 高 and Luan 欒 were annihilated shortly after. Jizha thereafter traveled to the state of Zheng 鄭, where he met the politician Zichan 子產 and also warned him to keep integrity and honesty to preserve the state of Zheng. The next station of Jizha was the state of Wei 衛, which appeared in a stable situation and was governed by sincere and competent persons like Qu Yuan 蘧瑗, Shi Gou 史狗, Shi Qiu 史鰌, Prince Gongsun Jing 公子荊, Prince Gongshu Fa 公叔發, and Prince Gongzi Zhao 公子朝. Arrived in Jin 晉, he heard bells being played although the period of mourning for the late duke was not ended yet. Jizha interpreted this as a bad omen and was quite aware that in the future the power in the state of Jin would fall into the hands of the viscounts (zi 子) of Zhao 趙, Han 韓, and Wei 魏. King Yuji was succeeded, as planned, by his younger brother Yumei (r. 530-527). King Yumei died soon, but Jizha refused to become the next king, and so Yumei's son Prince Liao 僚 (r. 526-514) was enthroned. Under King Liao's rule his uncle, Prince Guang 光 was defeated by the army of Chu and lost the royal dragon boat. In order to conceal the loss he head a new one constructed before he returned. Somewhat later Wu Zixu 伍子胥 arrived in Wu. He was the son of a noble in Chu and had fled when his father was executed. Wu Zixu soon became an intimate friend of Prince Guang and explained to him that the throne actually belonged to him, Prince Guang, who was a son of late King Zhufan. The political position of Prince Guang stabilized after he had finally defeated the army of Chu and the smaller contingents of Chen 陳 and Cai 蔡. This campaign had originated in a quarrel of some women in the border region about the rights of plucking mulberry leaves. Another campaign against Chu was begun when the king of Chu died, and the mourning phase provided an ideal situation to attack the enemy. Yet the commanders Prince Gaiyu 蓋餘 and Prince Zhuyong 燭庸 were cut off their supplies and had to return. At that moment Prince Guang decided to take action and invited King Liao to a banquet, where he was killed by an assassin called Zhuan Zhu 專諸. Prince Gong usurped the throne. He is known in history as King Helü 闔閭 or Helu 闔廬 (r. 514-496). Prince Jizha returned from a mission in Jin and, having learnt of the murder, proved himself a loyal subject of the dynasty. He continued doing his work because the ancestral altars were not touched. When the princes Gaiyu and Zhuyong heard of Prince Guang's usurpation they surrendered to the army of Chu and were rewarded with territory in Chu. They were killed three years later when King Helü attacked Chu. He had now the support of two political experts from Chu, one being Wu Zixu, and the other Bo Pi 伯嚭, who had also fled because the king of Chu had executed his father Bo Zhouli 伯州犂. The military campaigns of King Helü are a story of succession. He several times defeated Chu, and then Yue, a state located south of Wu. One of his highest commanders was Sun Wu 孫武, the alleged author of the famous military treatise Sunzi bingfa 孫子兵法. Wu Zixu and Sun Wu suggested asking the states of Cai and Tang 唐 for support and then brought into the field a large army that advanced far into the territory of Chu and finally forced the army of Chu into battle at the banks of River Han 漢. The king's brother, Prince Fugai 夫槩, defeated Chu and pursued its army to the capital Ying 郢 that was soon conquered. King Zhao of Chu 楚昭王 (r. 516-489) fled to the state of Sui 隋. Wu Zixu and Bo Pi revenged their fathers by desecrating the tomb of King Ping of Chu 楚平王 (r. 527-516). In the meantime the state of Yue profited from the situation that the country of Wu was deprived of the main part of its army and invaded Wu. King Zhao of Chu was also successful in asking the state of Qin 秦 for support. Qin sent out a punitive corps that was able to defeat the army of Wu that still camped in the capital of Chu. Prince Fugai, well aware of the precarious situation, thereupon returned to Wu and usurped the throne, yet King Helü was soon able to expel him. Fugai fled to Chu and promised support to King Zhao of Chu. King Zhao returned and made Fugai governor of the town of Tangxi 堂溪. A year later, King Helü's son Prince Fucha 夫差 delivered another victorious battle to Chu, and this time, King Zhao wanted to be on the safe side and evacuated his capital. King Helü attacked in 496 the state of Yue, whose ruler Goujian 句踐 (r. 496-465) had built up a corps of death-defying warriors. While some of them made "hara-kiri" in front of the enemy, the stupefied army of Wu was attacked from another direction, and lost a battle near its capital Gusu 姑蘇 (modern Suzhou 蘇州, Jiangsu). King Helü died shortly later by a wound received during the battle. He was succeeded by Prince Fucha (r. 495-473), who had promised his father to take revenge. Two years later, Fucha defeated the army of Yue at Fujiao 夫椒, and King Goujian of Yue asked for peace. King Fucha, benignant because of the early revenge, wanted to accept King Goujian's offer to submit his whole people as slaves to Wu, yet Wu Zixu warned his ruler against such a benevolent stance. Fucha ignored Wu Zixu's warning and agreed to conclude a marriage of peace. In 490, Duke Jing 齊景公 (r. 547-490) of the state of Qi, located in the north of Wu, died, and a succession crisis erupted in Qi. King Fucha wanted to use this situation to conquer Qi, and again, Wu Zixu warned his lord that was unwise to undergo such an adventure when the state of Yue was not yet "digested". Yet King Fucha began the campaign and defeated Qi. When he came to the state of Lu, he asked that Duke Ai 魯哀公 (r. 494-467) might contribute cattle and sheep for offering. Zigong 子貢, official in the state of Lu, convinced King Fucha that such a sacrifice might hurt the traditional laws of the house of Zhou. The campaign lasted for two more years before King Fucha returned to Wu. During these years, King Goujian of Yue had prepared the liberation from the yoke of Wu. He initiated his revenge with a rich present offered to King Fucha. Wu Zixu, well aware of the danger in which the state of Wu was through exhaustion and secret preparations for war, confided his son to Lord Bao 鮑 of Qi into security. When King Fucha heard of this, he forced Wu Zixu to commit suicide. Before he died Wu Zixu asked someone to take out his eyeballs and hang them over the city gate in order to demonstrate that Wu Zixu had always been a vigilant protector of Wu. Shortly after, Lord Bao killed Duke Dao of Qi 齊悼公 (r. 488-485), and King Fucha used this situation to attack the state of Wu by sea, but the landing troops were defeated. King Fucha had a fortification constructed at Han 邗 (near modern Yangzhou 揚州, Jiangsu) to protect the way to the north. He had also dug out a canal between the Yangtze and the River Huai northwards, the so-called Canal of Han 邗溝, which is actually the oldest part of the Grand Canal 大運河. In 482, King Fucha assembled the regional rulers (zhuhou 諸侯) at Huangchi 黃池 (near modern Fengqiu 封丘, Henan) and had himself elected hegemonial lord (ba 霸). When he returned he was faced with an invasion by King Goujian. The army of Yue defeated Wu, the heir apparent You 友 was captured, and the capital occupied. King Fucha, so humilitated, lost his title of hegemonial lord to Duke Ding of Jin 晉定公 (r. 511-475), who had older dynastic rights than the house of Wu. When King Fucha came back home he found a devastated kingdom, no heir, and a totally exhausted army. In 478, Wu experienced a second short invasion by Yue after the battle of Lize 笠澤. From then on the army of Yue annually paid a visit to the country of Wu, and in 473 King Goujian had King Fucha resettled to Yongdong 甬東, where he was made master over a mere hundred households. Yet Fucha preferred to cut his throat rather than to accept this humiliation. The country of Wu thus became part of the state of Yue. The name of the old state of Wu was many times used for the domains of imperial princes, as state name for one of the Three Kingdoms (Sanguo) 三國, and for one of the Ten States (Shiguo) 十國 of the south after the collapse of the Tang dynasty 唐. A further state of these ten even combined the name of old Wu and Yue: Wu 吳 (902-937) and Wu-Yue 吳越 (907-978). Taibo "The Great Earl", Ruler of Wu 吳太伯 (or 泰伯) Uncle of King Wen of Zhou 周文王. Shiji 史記, 31, Wu Taibo shijia 吳太伯世家. Luo Shilie 羅世烈 (1992). "Wu 吳", in Zhongguo da baike quanshu 中國大百科全書, Zhongguo lishi 中國歷史 (Beijing/Shanghai: Zhongguo da baike quanshu chubanshe), Vol. 3, 1232-1233.